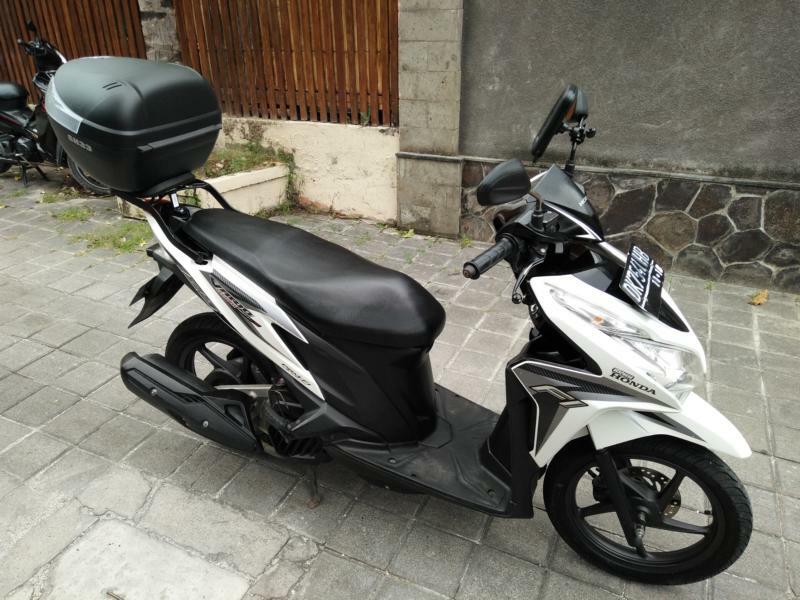 If you want to explore Bali individually, then is a scooter or motorcycle your best choice. They are flexible not stuck in traffic and you get direct the experience of the lovely life in Indonesia. The biggest problem was the navigation. With a few street signs you might find the Tanah Lot, but how you find the way back to the hotel? We have been thinking for a good solution! We fix a mount at the handlebars. The Case for your mobile phone is waterproof and keep your mobile safe and clean. You use your display as normal. We support with free software-app and Indonesian map for your mobile phone. Alternatively, just use a sim-card and Google Maps. In no time you get a full Navigation GPS – System. You are no longer lost on Bali. Your popular Restaurant, sightseeing or a trip up in the mountains... Your mobile phone show you the way! Have a good drive and great Adventures! For the Kawasaki Bikes we have a frame with Mount for the handlebar. You can use the Garmin GPS Navigation individually, or we give you a Roadbook for on- or offroad trips. Points of interest (beaches, temple, winding roads....) dependent what you like to see. Our electronic maps are very accurate. Pocket WiFi 3G is the perfect portable wireless hotspot. It's small so you can slip it into your pocket or bag to stay connected when you on the move. Your Pocket WiFi Router sends out a WiFi signal so that you can connect to the Internet without the need for wires. Link up to five WiFi enabled devices at any one time, for example your Laptop, Mobile phone, Tablet and much more. 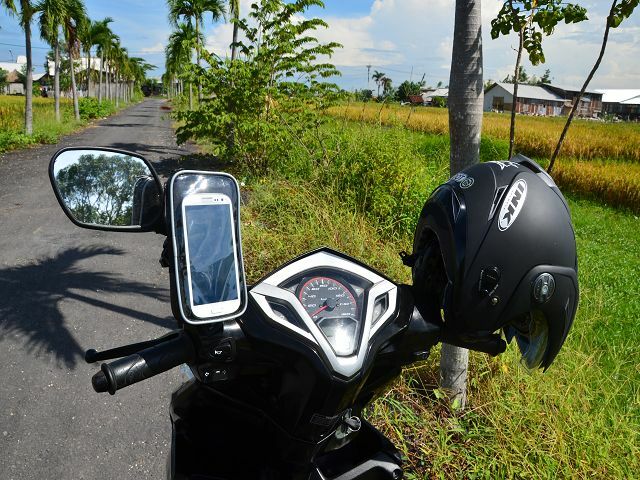 Together with our mobile mount for the handlebar, it will be perfect to navigate with google maps the crowded traffic and hurly-burly on Bali streets. For navigation in Bali or whole Indonesia. Whatsapp, Skype, Email and all other Internet based application will works all the time. Forget it to ask in Restaurants or public places for access to slowly WIFI Spot. You have your own WIFI any time in your pocket. We deliver the device charged with 4,5 GB. That´s more than enough for all your standard browsing. Please note, it is a volume based tarif. For streaming or high speed Internet better upgrade to 4G with higher speed and volume. Ask us for a price. Available for all motorcycles and scooters! These saddlebags you get your entire luggage stowed. It is possible to mount them on scooters, on all Kawasakis (KLX & Pulsar) and Honda CB 150 R.
With 36 liters of volume is enough space. The annoying backpack on your back is no longer necessary. More comfort with two riders on a Bike. All vehicles are two rider suitable if the saddlebags mounted. For even more space, we also offer roll bags incl. Straps. Saddlebag 100% watertight , made of 420D Nylon double-sided PVC Coating. Fastened 3 fold on top to secure watertightness. It includes a front zipped pocket and an injected handle. Moreover, it includes 2 rigid band to get the sw42 rigid in very easy and quick way. After 14 days rental period free! ﻿The best road map we could find in Indonesia. For highest details maps take the street atlas from Bali oder Indonesia. You can use it to paint your tracks inside, a good souvenir. For people who go on tour to the mountains. The first aid kit is free!! Please inform us in advance if you like one. In case that the first aid kit will be used, please pay the used supply so we can make it back completely. In the event of total loss to be paid $ 25.
a Helmet upgrade with higher standard for a safe Ride. This Helmet in Enduro style hast visor and sun visor. Well ventilated for a safe and pleasant ride specifically in a tropical country. note: for all Kawasaki KLX 250 is this helmet already included, our Standart. Our prices are in USD calculated. For long term rent (more than 4 weeks) please contact us. We provide an individual offer.